In the wake of the election, many of the economic indicators we track here each month saw substantial improvement. There was some weakness going into the election, but the news since then has been stronger. Although job growth continues to tick down, consumer confidence has rebounded in a big way, and business confidence has also continued to move higher. Overall, positive trends appear to have resumed in the most at-risk areas. The signal for the economy remains a green light, and a brighter one than we have seen in recent months. After a bit of a drop in October, service sector sentiment rebounded strongly last month, moving further into expansionary territory and continuing the recent uptrend. 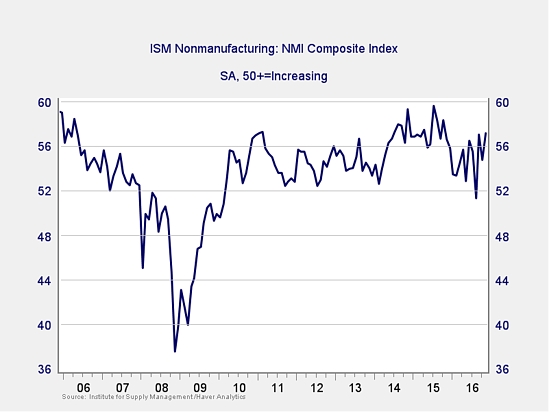 Despite the volatility in the ISM Non-Manufacturing Index, the sustained upward move is encouraging, particularly in light of improvements in other data. Continued strength in the service sector is consistent with business confidence; as a representative sample of the largest sector of business, this is an important leading indicator. This month’s job creation number came in roughly in line with expectations, but the details were somewhat weaker. 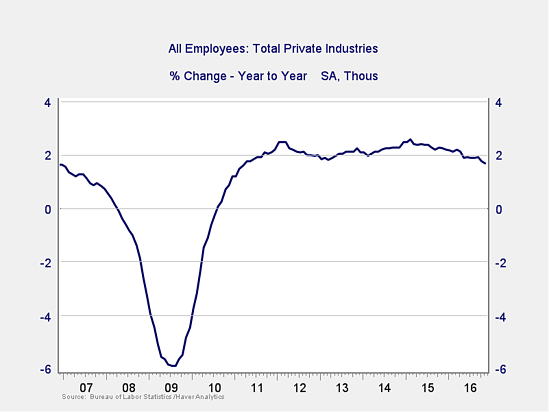 Longer-term growth trends are slowing, but this is consistent with this stage of the employment cycle. The big news here was disappointing wage growth, which declined instead of increasing, as was expected. This may have been due to aftereffects of Hurricane Matthew and is no cause for immediate concern, but it will be worth watching. Because this is an annual figure, the changes are slower and smaller than those we see in more frequently reported data. The annual trend is slowing but remains at levels consistent with stable growth and those of the mid-2000s. Overall, given the volatility of employment growth, this indicator remains a green light. These are the same numbers as in the previous chart, but on a month-to-month basis, which can provide a better short-term signal. November’s job creation was in line with expectations, but the details were weaker than the headline number would suggest. Nevertheless, this indicator is still within the range of the past couple of years. 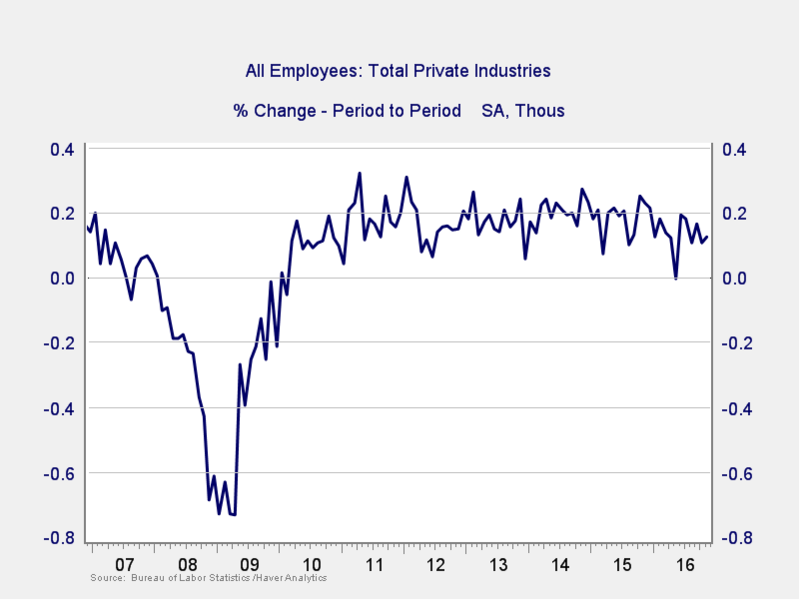 The monthly data does seem to be weakening, but that is consistent with the late stage of the employment cycle and probably not cause for concern in the short term. We’ll keep this at a green light, but I’ll be watching to confirm that the positive trend of job growth continues. 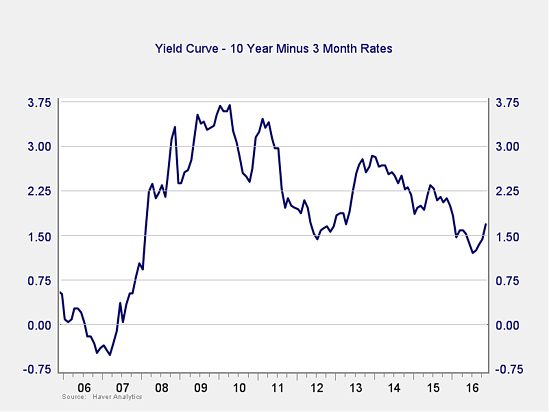 Expectations for faster growth and higher inflation drove up rates for the 10-year Treasury substantially after the election; short-term rates remained stable, widening the spread. With markets convinced that the Federal Reserve will raise short-term rates this month, the spread may decline but should remain at healthy levels. The current increased spread puts this indicator even further outside the risk zone, and the change in trend is encouraging. Consumer confidence improved substantially last month, beating expectations by a wide margin. The year-on-year change returned to very strong levels, reversing most of the decline over the past year. With the improvements in the past two months, especially since the election, the year-on-year change has moved back above zero, well away from the trouble zone. Given the improving rate of change and the healthy base confidence level, this indicator is no longer suggesting elevated risk, and I’m reinstating a green light here. Business confidence has become very volatile, but this month’s bounce takes us to another recent high, extending the positive trend of the past several months. 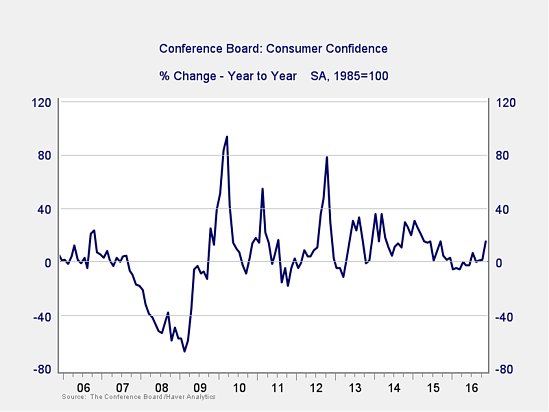 Consumers remain confident on an absolute basis, and there has been substantial improvement recently, suggesting that they will continue to support economic growth. Overall, conditions remain positive and look likely to continue. With recent improvements in data and sentiment, the economic risk level has declined. Though we certainly need to watch how the economy evolves, I’m leaving the overall indicator at a green light.